From the Editor: Many Federationists pride themselves on having studied the writings of Kenneth Jernigan. His published speeches, articles, and letters are eminently worth the investment of any time spent reading and reflecting on them. But Dr. Jernigan spent many hours almost every day writing. Many of the resulting documents have been published very narrowly or not at all. James Omvig, who is a noted writer and trainer in the blindness field and who worked closely with Dr. Jernigan for many years, has undertaken the labor of love of gathering many original source documents of the first ten Jernigan years at the Iowa Commission for the Blind and assembling them so as to tell the behind-the-scenes story of the creation and development of the first rehabilitation program truly to embody the philosophy of the National Federation of the Blind. This book, The Blindness Revolution: Jernigan in His Own Words, will be available for the first time in print and Braille and on two- and four-track cassette tape at the convention this summer. After the convention it can be ordered from the NFB Materials Center. Following is a slightly paraphrased excerpt from chapter three of the book, which describes in more detail how the book was assembled. 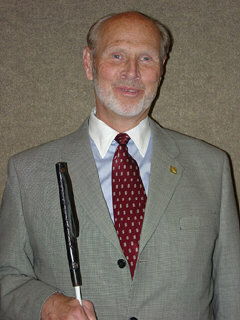 Kenneth Jernigan's influence upon the lives of blind people is unparalleled. He literally became the voice of the blind of America, and his public writings and utterances became the blueprints for freedom and self-respect for the blind. His published writings on blindness, his philosophy, and his organizational skills were the hallmark of his life. In The Blindness Revolution, however, we will examine, not his previously published and known writings, but never-before circulated and pondered documents that were significant in the blindness revolution that occurred and the rise of the Iowa Commission for the Blind from an obstacle for the blind to prominence in the world. There is much to be learned in these writings not only about Jernigan, the man, but also about those personal traits and characteristics that are important to any superior administrator of an agency for the blind. As part of his regular duties, Kenneth Jernigan personally wrote the official minutes of Commission for the Blind board meetings. He also wrote reports to the board and to governors, letters and other documents supporting the arguments for change he was making, and documents that described the new philosophy of the Iowa Commission for the Blind.����������� Throughout The Blindness Revolution, selections from these Jernigan writings will be used to tell the story of the revolution. Where appropriate, James Omvig provides commentary and offers facts not obvious from the Jernigan writings themselves. It is said that, by reading the writings of a prominent figure in history, one may actually have a sense of carrying on a conversation with that writer. Much can be gained from the Jernigan writings in the conversations that follow. There may be those who have always assumed that the transformation of the Iowa Commission for the Blind from a regressive state agency to one of excellence was an easy task�just find a disgraceful agency in need of a director, get yourself hired, infuse the Federation's constructive philosophy about blindness into all of its programs, and voila, an outstanding agency will be the result. Those who have made such assumptions were wrong. The task was difficult; it was epic. In addition to finding an agency in need of a director, Kenneth Jernigan found virtually no program money, no staff, no decent space in which to operate an effective program, a hostile attorney general who later became a hostile state governor, a devastating fire, and an encounter with a traditional blindness professional who fought progress every step of the way. The Blindness Revolution is a story of foresight, prescience, determination, political savvy, and high achievement.